When you’re waiting long enough to take a picture, you may wish for self-service. 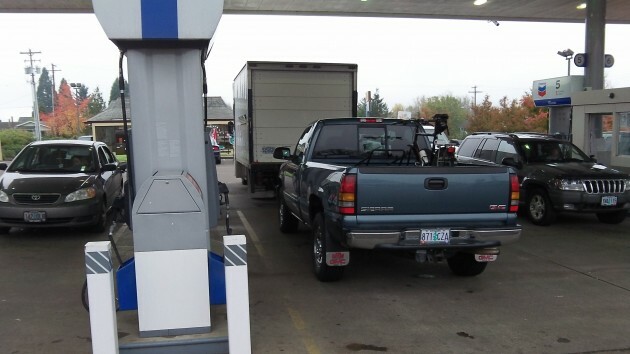 Sometimes you get the idea that it might not be a bad idea for Oregon finally to give up its ban on self-service fuel. But then the weather changes and you think no, for that and other reasons, let’s just keep the law the way it is. The way it is, unfortunately, is ridiculous on its face. Gas station operators are prohibited from letting customers pump their own gas. But not always. Motorcycle drivers, for example, may be handed the fuel nozzle so they can fill their own tank. But they are not allowed to return the nozzle to the pump. Instead they must hand it to the attendant, who then returns it. Plainly this provision is idiotic. If a guy standing by his Honda Shadow or Harley, say, can be trusted to fill his tank without setting the station ablaze, why can’t we trust him to hang up the hose? You think about all this when you stop at a station where you have to wait for an attendant to get around to you. It may be only a minute or so, but it seems like much longer when you’re trying to get some place. It’s hard to resist the temptation to insert your card, hit the button for regular, fill your tank and take off. But you don’t want to cause trouble for the kid on duty, the kid who eventually does get around to you. He’s busy, so there’s no question of getting your windshield cleaned. You squeegee it yourself, Oregon not yet having enacted a law against that. Based on that experience, you may be ready to wish self-service was allowed. But then you remember some of the other Oregon stations where you’ve stopped in the last few weeks. At the ones in Albany, service is usually prompt, and it often includes the windshield. The people working there — not all of them are kids — do a good job, and you don’t want any of them to be out of work. I agree it’s a stupid law. It’s not like we read about a card-lock fueling station burns to the ground every few days. It’s like Oregon and New Jersey is admitting that their drivers are so incompetent they can’t be trusted to fill their own tanks. But by George anybody from 16 to 105 with a regular driver’s license and no special training can drive an RV the size of a Greyhound bus. Now that’s a stupid law. And as for the percentage of drivers that claim “I don’t want to pump my own gas” I don’t think I’ve ever driven an a state that allows do it yourself fueling that doesn’t provide full service pumps where they’ll do it for you. Although you pay a few cents a gallon for that service; and that’s only fair. Once again I will respond to your editorial, as I did before when the issue of self service gas stations was raised. Remember, this is an issue the voters have been asked to decide multiple times. Each time it is on the ballot, the oil companies pour millions into the campaign, and each time Oregon voters reject self service. Now you have to ask yourself, why do the oil companies want self service? Is to save consumers money?… doubtful!! It is so they can run corporate owned stations, each with one employee in a cubicle, with an area manager for multiple locations. The result would be independantly owned stations, like many/most in our area would be pushed out of the business. This is not an example of big, bad government making stupid rules and regulations that stymy economic growth and freedom, as much as you try to make it out to be the case.Voting Oregonians have made this decision.